Keep your guests and their details organized. WeddingWire&apos;s free Guest List makes RSVPs easy. 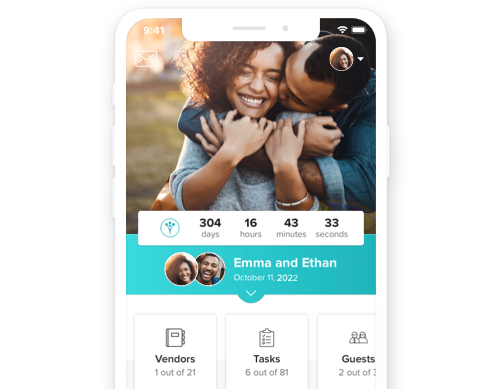 Seamlessly create your Guest List and manage details for all of your wedding events. Easily import from your contacts or add one by one. RSVPs. Dinner choices. Plus ones. Because each guest comes with lots of info. Manage multiple events and organize your guests by any category. Guests can easily RSVP online through your Wedding Website. I would have been so much more stressed out without the guest list feature here. I still look at my WeddingWire guest list on my phone for people's addresses and we got married 10 months ago. Creating your wedding guest list can be a daunting task, but our easy-to-use tool keeps everything in one spot. Start by adding all the wedding guests you’d like to attend, then build out the list from there with RSVP info, meal choices and more. So, who made the cut? Once you add family and friends to the wedding guest list, you’re ready to add more info, like addresses, RSVPs and gifts. Because each guest comes with a lot of info, it’s important to keep everything organized. WeddingWire’s wedding Guest List tool helps you do that, and it’s a total sanity-saver. You can even sort your wedding guest list by category with one click. When your wedding invites are ready to go, we make it easy to send addresses from your wedding guest list. Simply export them and email everything to your invitation provider, and check that task off your to-do list.